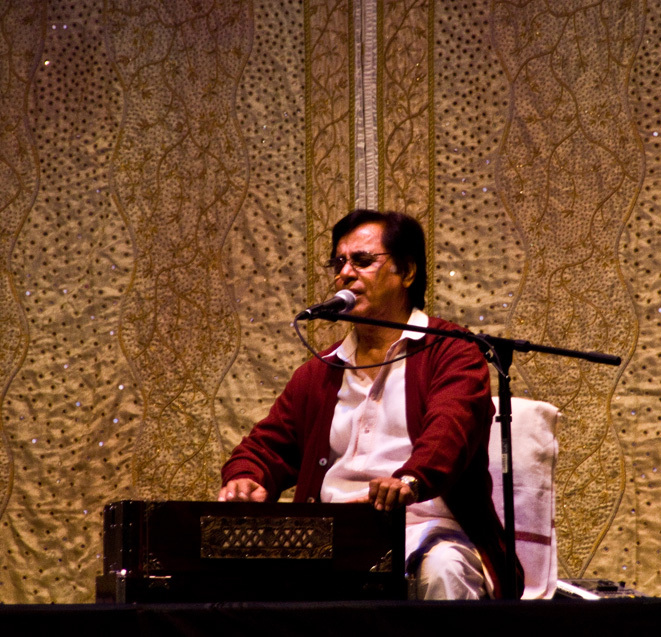 Jagjit Singh in concert at Durham, NC. April 2009. “Jaggu-Chittu” was how we addressed the pair when in high school. Their music lifted our hearts, had us sing to our loves, and connected us to the mysterious. Chittu took her voice away after the loss of her son. And now, Jaggu is gone. I did not know him personally. Nor have I met him, though I did attend a concert 2 years ago. And yet this seems like a personal loss. In fact, my first personal great singer loss. Because the way I associate with Rafi, Kishore, and Jagjit is unlike any other singer, except maybe Lata and Asha but they are both alive. Rafi sahib passed away when I was learning the alphabets. Kishore da said goodbye when I was still a kid. And so their loss did not register the way this one did. My thoughts go back to that evening, some 15 years ago, when listening to the album Insight, I peeled a few layers off my ignorance. Translation: In the company of the good, you acquire goodness. Just the way sunshine becomes sweet upon meeting the ripe mango. Also see this previous post. A true loss for his one other fan! I have taken few 12-15 hours trips and the only thing which I can listen to for a long period has been Jagjit Singh Saheb. From now on, this loss will make the future trip entertainment even more meaningful.